My client Jasmine is in 7th grade, has ADHD, and is an organizational disaster. Last week I asked her to organize her accordion folder by class; this week she had failed to do so. Papers were everywhere, in all kinds of disorder. And then…I pulled out a tool that changed everything (dun dun duuuuuun! ): my label maker. Whereas before she was a happy but distracted kid totally disinterested in organizing, suddenly she was a changed child: sitting up straight, typing in all her little labels, cutting them out, putting them in all the correct slots in her file. “Of course,” I responded… and soon she had a new sticker gracing the front of her planner as well. Of course, it remains to be seen whether she actually maintains her organization system. However, we’ll tackle that next week. I’m thrilled that she actually HAS an organization system to MAINTAIN thanks to the label maker. 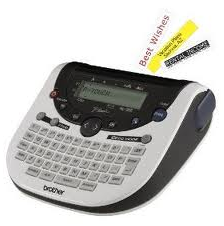 Have you tried a label maker in your own household? Did it drastically shift your ability to organize? I’d love to hear about it! Please comment, below. P.S. Do you know a student who could use some help organizing? Forward them this article!